Looks like no one can stay away from entering the Smartphone / Tablet space. 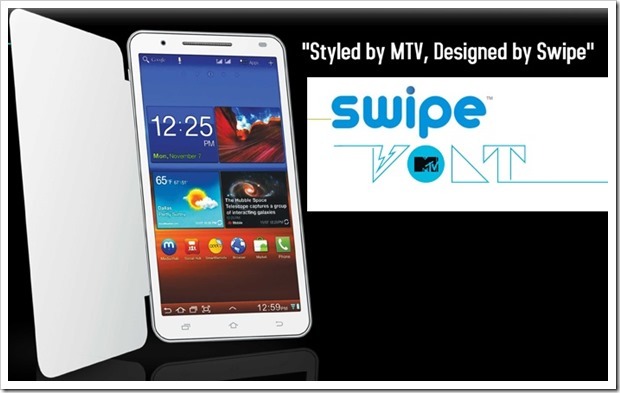 Now, MTV has gone ahead and announced launch of “Swipe MTV VOLT” a 6 inch Phablet (Phone+tablet). The Phablet has been bought into the market by Swipe in Partnership with MTV. Although it has not been clearly mentioned, it looks like Swipe will be handling manufacturing / procurement and inventory of this phablet, while MTV has lend its brand name, making it quite appealing to younger generation. MTV, the youth brand of Viacom18, will undoubtedly bring more weightage to this phablet. Even according to Swipe Telecom, MTV VOLT is a ‘made to order’ product for the generation that’s constantly communicating, entertaining and socializing. The unique feature of this phablet is an exclusive in-built TV player that will offer Volt tablet owners on the go access to MTV content. It is not clear how this MTV content will be offered, but if it is through 3G data access, it may not be appealing given the data transfer costs that users will incur. MTV VOLT is light weighing only 239 grams – Most of 7 inch tablets are 300 grams and upwards. It comes with 1 GHz Dual Core processor (MTK 6577) and has a HD Capacitive 5 point Multi-Touch Display. Although the display is good, the resolution of this phablet is a modest 854 X 480. As is the norm now for such tablets-phablets-smartphones, it comes with Dual-Sim and has a 4 GB internal memory expandable upto 32 GB using SD card. However, the most disappointing aspect of MTV VOLT is its RAM. At 512 mb, it will not be sufficient for resource hungry applications/games needed by today’s younger generation. At Rs. 12,999/-, MTV VOLT should appeal to a section of young consumers who want to own a decent brand, but at the same time do not want to spend too much! Cleartrip Pricewatch: If ticket prices fall, you get your money back! How many more tablets and smartphones are coming..! Looks like, There is a huge profit margin is there in this..! @Mihir – The margins are falling. yes, initially the profit margins were huge…but thats not the case now. Aakash set the lower benchmark and everyone had to come down on their pricing. The reason why everybody is getting into tablet-phablet game is that it is supereasy. You do not have manufacturing headaches…and China sells it very very cheap when taken in bulk. Just re-brand the product and sell.. And given the current market conditions, where everyone wants to go for it.. it makes a ideal choice for any big brand to enter.. Ya, That’s correct. I think, this is the opportunity to leverage their brand name. But, The question is, If they are not up to mark when it comes to performance, doent it affect the brand name also ?? What do you think ?